Idaho has no shortage of excellent pumpkin patches throughout the state. Truly, this list could easily have included double the number of patches. But alas, the following ten really stood out for their excellent selection, value, and overall spirit. Experience the fall spirit for yourself and find the perfect pumpkin at the following ten spots in Idaho. U Pick Red Barn in Idaho Falls, Idaho opens for the fall season on in mid to late September. U Pick Red Barn invites you to enjoy picking your own pumpkins, jumping in the corn pit, and going on a hay ride. Kids will love riding on the vintage-style train, too. Sign up online for their newsletter and to receive one free mini pumpkin during your stay. The Farmstead Corn Maze and Pumpkin Festival is known for their corn maze, horror attractions, and pumpkin patch. Ranked Idaho’s’ best Pumpkin Patch by Reader’s Digest, their website invites you to “choose from pumpkins we have picked or take a hayride to the patch to find you perfect pumpkin.” Pumpkins start at 37 cents per pound. The owners of Tubbs Berry Farm describe themselves as a “small working family farm in Twin Falls, Idaho.” They may not offer a lot of frills, but their attractions are so much fun that they don’t need a lot of bells and whistles. 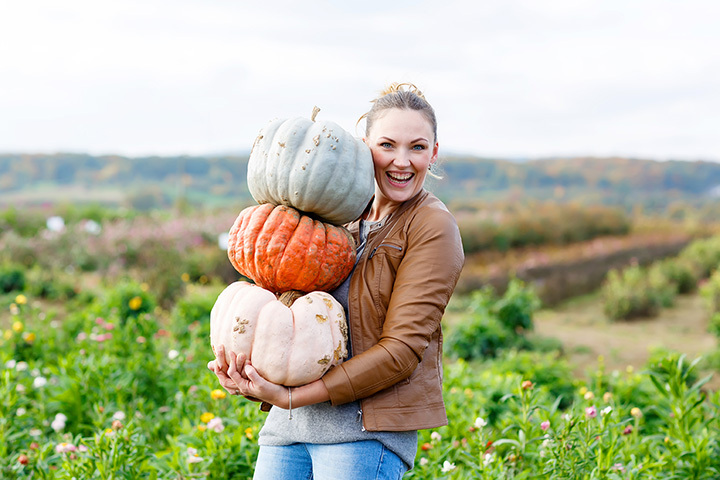 Their on-site u-pick pumpkin patch opens at the end of September and runs through October. Prairie Home Farm Pumpkin Patch and Produce Stand is “located on a little patch of heaven just on the edge of the Rathdrum prairie,” according to their website. Their u-pick pumpkin patch offers pumpkins right off the vine as well as already snipped options at the front. Cabalo’s Orchard is a humble spot in Kuna, Idaho that has brought u-pick pumpkin goodness to the area for the last 12 years. Take advantage of their free hayrides out to the patch where you can look for decorative pumpkins as well as edible ones. Make sure to try their Idaho Grown Popcorn and Delicious Local Raw Honey before you go. For over a quarter century, Jeremy’s Pumpkins in Star, Idaho has provided a wonderful, family-friendly spot for pumpkin picking. They are open for the entire month of October. One recent reviewer said, “Jeremy’s has the very best selection of pumpkin and gourd varieties in the valley.” Sounds good to us. RC Acres Pumpkin Patch, opening at the end of September, can’t wait to start celebrating the fall season with you. They’ve got a wide range of family-friendly activities planned, including a craft barn, train, and fishing. This, in addition to their pumpkin picking options, all of which are stellar. The Berry Ranch brings u-picking to Nampa, Idaho, throughout the year. Visitors know that they can come during just about any season to pick berries, corn, and, in the fall, pumpkins. Pumpkin picking begins at the end of September and continues through the end of October. Swore Farms in Pocatello, Idaho has a very specific mission: “To enrich the community through healthy, delicious, fresh produce grown right here on the farm…and offer opportunities for quality family fun late summer through fall,” according to their website. Pumpkins are ready for picking in October and are 25 cents per pound for orange pumpkins and 20 cents per pound for green. The Burley Straw Maze and Pumpkin Patch offers admission to all of their fall activities, including maze, slide, barrel train rides, and pumpkin patch, for only $10. Pick your own pumpkin until dark. Pumpkins are priced per pound and start at 25 cents. If you can guess your pumpkin’s weight to the tenth, it’s free!